State Sen. Tom Casperson, R-Escanaba, was on Michael Patrick Shiels’ Lansing radio program today and had some fun and interesting things to say about where President Obama was born. Casperson, whose name might sound familiar to Metro Detroiters as a co-sponsor of regional transit authority legislation, just plum doesn’t know where Obama was born. (SPOILER ALERT: Hawaii.) His confusion and ignorance, according to Sheils, is shared by 74% of Michigan Republican Party convention delegates. Perhaps if there existed some kind of paper trail, a record that could somehow certify where a person was born, we could . . . wait, what’s that now? Such a paper trail exists! Huzzah! Let’s take a look at the “Certificate of Live Birth” issued by the state of Hawaii. Fascinating. But, you know, it seems like anyone could make that document after the fact to confuse poor Tom Casperson. Where is the birth certificate with all the hand-written dates and doctor’s signature and such? Why hasn’t any your liberal media dug that up “like there was no tomorrow”? You say Obama released that document? Interesting. Hmmm, but can we somehow verify this isn’t a forgery with an independent account of Obama’s birth. In the parlance of our president’s campaigns: Yes, we can. 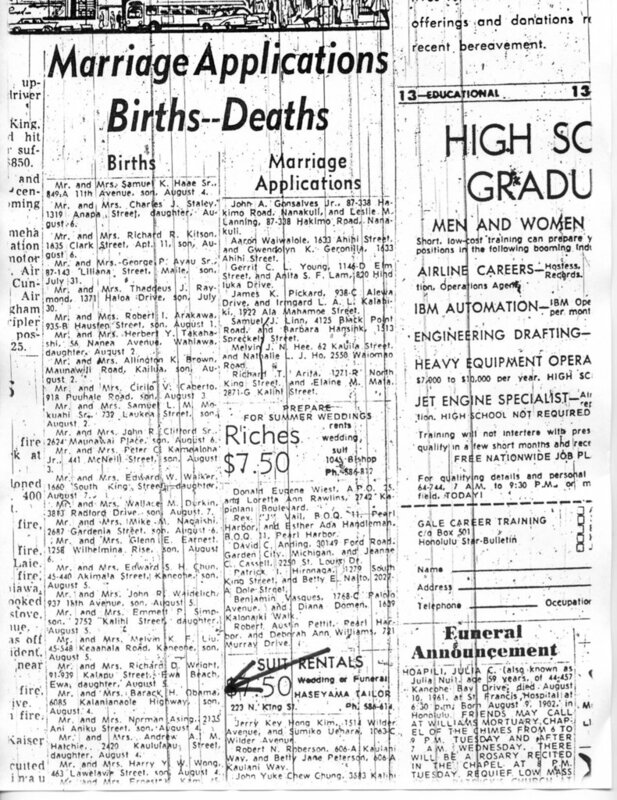 With contemporary newspaper birth announcements. But, maybe all this evidence has been faked by a massive conspiracy. If only someone with no interest in hiding the truth, like a political opponent, could conduct an investigation into this case, we could finally uncover the truth for state Sen. Casperson’s peace of mind. Turns out the McCain presidential campaign did that in 2008. Now that we’ve cleared up this issue for Casperson and the three-quarters of Michigan Republican Convention delegates who weren’t sure where the president was born — IT WAS HAWAII, YOU MORONS! — we can move on to other important investigations. Did football announcer Craig James really kill five hookers at Southern Methodist University? Just what does Richard Gere do with those gerbils? And how was Tom Casperson involved? Because Tom Casperson has never denied helping Richard Gere do unholy things to gerbils. Kind of makes you think, you know?